Please refer to our stock # 1739 when inquiring. From a collector of Chinese antiques; never seen the internet light of day. Please do not let the fair price detract from the value of this beautifully carved antique Asian Chinese cup. Also have an almost matching set of two, not seen here - one slightly rounder and an odd smaller one (total of 4 from same). 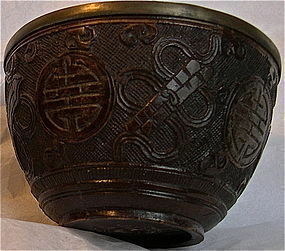 This is an early 1900s or earlier antique intricately carved rich brown coconut shell tea cup or bowl with silver color liner that appears to have been hammered into the shell and showing many interesting lucky symbols: swirls, curls, shou, sword, scrolls, fan, saber? Some refer to this "carved lacquer". 2" high X 3 1/4"
$14 USPS Priority/Ins/Track or FREE with USA Ck or USPS MO.